One way of making brushing fun is by letting your children pick out their own toothbrush. Since there are so many options at the average store, your son or daughter can choose from superheroes and princesses to personalize their experience. There are also various toothpaste flavors that are specifically designed to make brushing more enjoyable for kids. They can pick from different flavors like chocolate and bubblegum, instead of the boring mint flavors we are used to. If your child resists your efforts to get them to brush, let them pick from a handful of upbeat and fun songs to be their brushing theme song. Get them to dance and move while brushing to make it fun and pass the time faster. 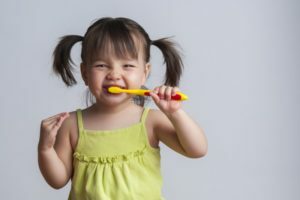 One thing a lot of children struggle with is brushing for the whole recommended two minutes each session. If you can find a song around 2 minutes long, you can make it easy by telling them they can stop brushing when the song is done! Brush your teeth at the same time as your children. Your loved ones want to be like you and they tend to mimic what you do, so show them brushing is something that you enjoy. Combine this tip with playing the brushing song for a fun family party in the bathroom! If all else fails, incentives work great on kids. Creating a sticker chart to track each time they brush their teeth can be a fun, cheap, and healthy way to motivate your son or daughter to brush. You can use this chart to keep track and give them a prize when they’ve brushed their teeth twice a day for a whole month. Although brushing teeth should only take 2 minutes, it can turn into much longer when your children refuse. Use the tips and tricks above from your dentist in Fort Worth to make brushing fun, and even something your child looks forward to. Dr. Jasmine Coleman King likes getting to know her patients to provide them with personalized care. She stays up-to-date on all the latest techniques in dentistry through continuing education courses. Being a mother herself, she knows that schedules can get hectic, which is why she offers treatments for the whole family at Summer Creek Dentistry. She can be contacted through her website or by phone at (817) 292-7488 for any questions.